Semiconductor devices like the crystal detector work by quantum mechanical principles; their operation cannot be explained by classical physics. The birth of quantum mechanics in the 1920s was the necessary foundation for the development of semiconductor physics in the 1930s, during which physicists arrived at an understanding of how the crystal detector worked. 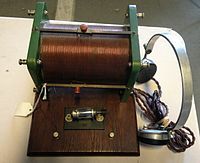 The German word halbleiter, translated into English as "semiconductor", was first used in 1911 to describe substances whose conductivity fell between conductors and insulators, such as the crystals in crystal detectors. Felix Bloch and Rudolf Peierls around 1930 applied quantum mechanics to create a theory of how electrons move through a crystal. In 1931, Alan Wilson created quantum band theory which explains the electrical conductivity of solids. Werner Heisenberg conceived the idea of a hole, a vacancy in a crystal lattice where an electron should be, which can move about the lattice like a positive particle; both electrons and holes conduct current in semiconductors. This page was last edited on 16 April 2019, at 17:43 (UTC).